General Electric Co. (NYSE:GE) announced a deal to combine its oil-and-gas business with Baker-Hughes, creating one of the world's largest providers of equipment, technology, and services to the oil and gas industry. Worldwide drilling activity had peaked in November 2014, the same month that Saudi Arabia had started the war for market share, which eventually caused oil prices to collapse. 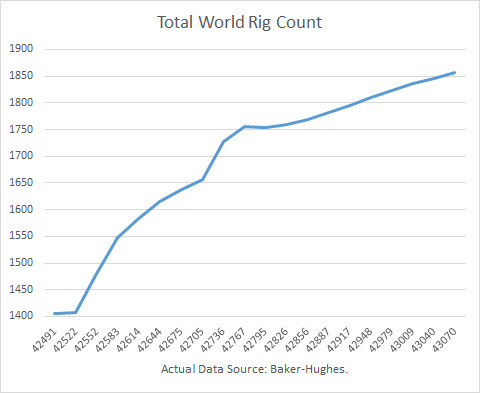 As oil prices plummeted, so did the rig count. Active rigs worldwide fell from 3,670 to 1,405 in May 2016, a 62% drop. 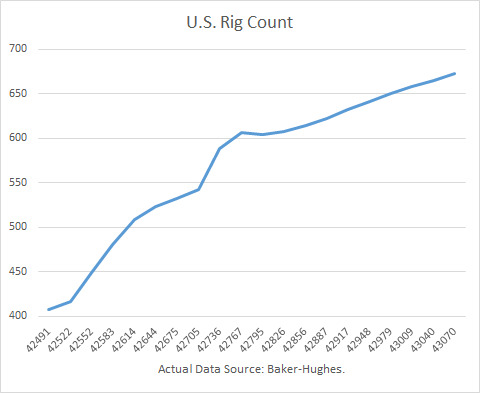 In the U.S., rigs fell from 1,930 t0 408, a 79% drop. But as oil prices rebounded to $50/b in late May, the rout ended. 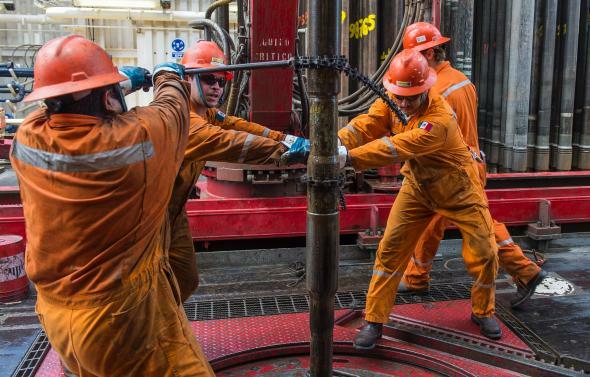 Since May, active rigs rose by 25% in the U.S. and by 13% worldwide. Although Jeff Immelt, the chairman and chief executive of General Electric Co., said that GE's strategy in the oil and gas business was not about timing crude oil spikes, my outlook for rig activity in 2017 indicates his timing may indeed be good. My model, as described below, indicates that U.S. rig activity should increase by 30%, whereas world rig activity should rise by 15%. These increases have broader implications for the U.S. and world oil markets. OPEC has committed itself to limiting its crude production output to a target level of 32.5 to 33 million barrels per day. That could require a cut of 1-2 million barrels per day by Saudi Arabia and the Gulf producers because output from Nigeria, Libya, Iraq, and Iran are set to increase if political conditions allow. In the U.S., new monthly data show that U.S. crude production bottomed at 8.7 million barrels per day in July 2016. That ended a decline of 1.0 million barrels per day from April 2015. The Energy Information Administration reported that production for August 2016 rose by 51,000 b/d from July. Producers are completing more "Drilled But Uncompleted" wells (DUCs) than they have been drilling, and new projects in the Gulf of Mexico, started years ago, are expected to add several hundred thousand barrels per day. Given the growing influence of shale oil production on total U.S. production and its variant economics compared to conventional oil, I limited my modeling time-frame, to begin with, January 2013. I created a multiple regression model using lagged crude futures prices (3-month lag) and lagged rigs. Using total drilling rigs, ignoring the split between oil and gas, I obtained an adjusted r-squared of 99.2%. All t-ratios were highly significant. The fitted data (from the regression) are compared to the actual monthly data as depicted in the graph below. Using my regression model and NYMEX crude futures prices (October 31, 2016), I projected rigs out through 2017. The forecast for 2017, which shows a 30 percent increase for 2017, is depicted below. I applied the same regression approach to total world rigs, using the same explanatory variables and timeframe. The r-squared (goodness of fit) was 98.6%, almost as high as the U.S. fit. Again, all t-ratios were highly significant. The fitted data (from the regression) are compared to the actual monthly data as depicted in the graph below. I used the regression equation and NYMEX crude futures prices (October 31, 2016), I projected rigs out through 2017. The forecast for 2017, which shows a 15 percent increase for 2017, is depicted below. Mr. Immelt was quoted, "Oil and gas customers demand more productive solutions." GE intends to help Baker Hughes provide more sophisticated drilling techniques to compete in a world where oil prices may rise very slowly. According to my models, his timing appears to be good. At current futures prices, the demand for rigs should continue to rise out from its slump. The worst seems to be over. Continue to rise out from its slump. The worst seems to be over, though higher production will likely keep a lid on oil prices for 2017.